Keegan Michelle is one of our regulars using our EBOOST products in the wild (as well as being one of our amazing ambassadors) but she is also a regular in the kitchen coming up with some healthy recipes with EBOOST products. Keegan’s absolute favorite thing to do is turn some of her favorite indulgences into healthy snacks–we are a sucker for this too! It is a great way to maintain your healthy lifestyle without depriving yourself of foods that are on your ‘bad’ list. 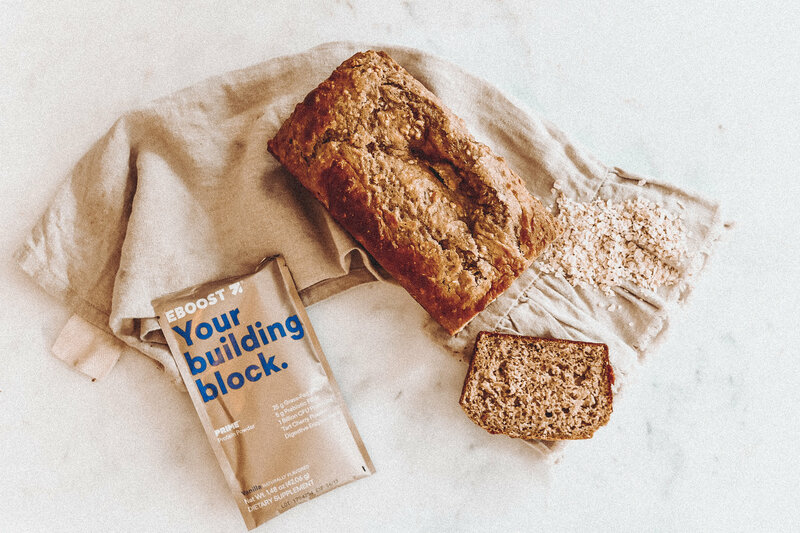 This clean protein banana bread is it is a great balance of protein, carbs, and low in sugar compared to some other quick breads you see out there. Also, the secret is that Keegan didn’t just make protein banana bread in her kitchen. She made the best versions of banana bread you could possibly make–peanut butter and chocolate! Disclaimer: These recipes are made with wheat, so if you have gluten intolerance or preference, feel free to look up the alternative to the ingredients listed below with their appropriate ratios. Keegan is down with wheat so she paired it perfectly in these recipes. Preheat your oven to 350 degrees F. Prep your bread loaf pan, and get to mixing! Whisk the eggs, yogurt, bananas, agave, and vanilla extract (peanut butter, if doing recipe #1) together until blended well. Add the quick oats, baking soda, ground cinnamon and mix until almost completely mixed together. Add in the flour, protein powder, and walnuts/chocolate chunks and mix until completely blended together. At this point, it may be a little dry or thick. Now is when you add in the almond or soy milk. This is purely for moisture, so start with 1/4 cup and if it still seems too thick, add 1 tbsp at a time more until you get your desired consistency. It should be on the thick(er) side, so be careful not to add too much and get pancake batter! These are the BEST warm, so either enjoy right away or toast them later on!